This bottle belongs to a group of bottles from the mid-Qing period, all probably from the same workshops, all of which bear the typically courtly design of kui dragons surrounding central shou characters, the only difference lying in the color of the enamels used and whether the cloisons were completely filled, or only partially, as here. 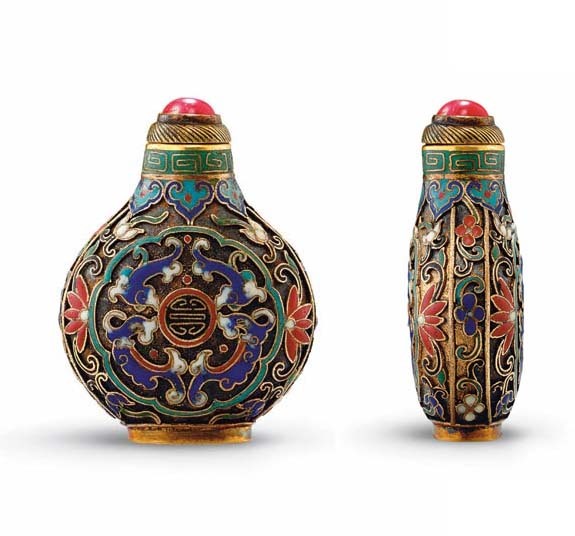 These cloisonné enamel bottles have thin strips of wire soldered onto the copper or bronze body, creating separate channels called cloisons, which are then filled with different-colored enamels and fired in a kiln at low temperatures for a short period of time. In the case of this example, however, only some areas were infilled, providing a design in relief against the gilded ground. For another example decorated in this technique, see a magnificent double vase, dated to 1786, in the Uldry collection (see H. Brinker and A. Lutz, Chinese . The Pierre Uldry Collection, no. 304). For another snuff bottle of the group, see Moss, Graham, Tsang, The Art of the Chinese Snuff Bottle. The J & J Collection, no. 267. See also one illustrated in Chinese Snuff Bottles in the Seattle Art Museum, pl. 55, lower left; one in the collection of the Marquess of Exeter with its original stopper, illustrated by H. Moss, Chinese Snuff Bottles No. 6, E. 30; one with original stopper illustrated by L.S. Perry, Chinese Snuff Bottles. The Adventures & Studies of a Collector, no. 162; one in the Denis Low Collection, illustrated by R. Kleiner, Treasures from the Sanctum of Enlightened Respect, p. 212, no. 229; and another in M. Hughes The Blair Bequest. Chinese Snuff Bottles from the Princeton University Art Museum, no. 339. One more extremely rare version of this design is illustrated in the exhibition catalogue, Laurence Souksi, Merveilles de la Miniature Chinoise. Flacons-Tabatières de Chine de la Collection du Commandeur, Paris, 2000, no. 2. The main difference between this technique of partial filling and the fully-filled technique lies in the final finish of the enamels. With the latter, once sufficient layers of enamel were fired into the cloisons they were polished flat, whereas with the present type the enamels were left a little in relief, giving a more jewel-like appearance.